Researchers at the Stevens Institute of Technology in New Jersey, USA, have produced electricity from mushrooms in a process involving bacteria and swirls of graphene nanoribbons. The ‘bionic’ mushrooms are actually common white button mushroom that have been supercharged with 3D printed clusters of densely packed cyanobacteria to produce electricity that is then collected by the nanoribbons. The team engineered an artificial symbiosis between the mushrooms and cyanobacteria, with the mushroom providing shelter, moisture and nutrients, and the bacteria offering energy through photosynthesis. Graphene nanoribbons printed alongside the bacteria help to capture electrons released by the microbes, producing bio-electricity. As well as producing an environmentally friendly source of energy, this advance in bacterial nanobionics, reported in Nano Letters [Joshi et al. Nano Lett. (2018) DOI: 10.1021/acs.nanolett.8b02642], increases our knowledge of the biological machinery of cells, and also how to use such complex molecular machinery to produce new technology in areas including defense, healthcare and the environment. 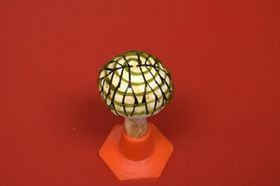 An electronic ink containing graphene nanoribbons was 3D printed onto the cap of a living mushroom in a branched pattern, before printing a bio-ink containing cyanobacteria onto the cap in a spiral pattern. This intersected with the electronic ink at multiple places, and it is at these points that electrons are able to transfer through the outer membranes of the bacteria to the conductive network of nanoribbons. Shining a light on the mushrooms activated cyanobacterial photosynthesis, generating a current of around 65 nanoAmps. While not strong enough to power electronic devices, an array of bionic mushrooms could generate enough current to light up an LED. The amount of electricity produced by the bacteria is based on the density and alignment with which they are packed, and the 3D printing meant they could assemble them to boost their electricity-producing activity by eight times more than the casted cyanobacteria. The mushrooms acted as a suitable environmental substrate with functionality of nourishing the energy producing cyanobacteria. As co-leader Sudeep Joshi said, “We showed for the first time that a hybrid system can incorporate an artificial collaboration, or engineered symbiosis, between two different microbiological kingdoms”. The research helps toward new applications that integrate bacteria with nanomaterials to produce bio-hybrids and the next generation of bionic architectures. The team are now exploring ways to generate higher currents with their system, and how their 3D printing approach could organize other bacterial species in complex arrangements to perform functions such as bioluminescence. APWorks, a subsidiary of Airbus Group, has introduced a lightweight 3D printed motorcycle, made using its Scalmalloy aluminium powder.